Konverzace o dětství je vždycky vděčné téma. Naučte fráze, které může při konverzaci v angličtině využít. 2. What did you like to do when you were a child? 3. What did you look like? 6. 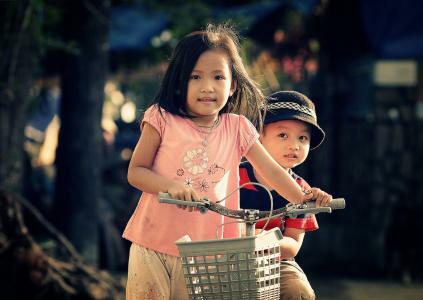 How old were you when you learned to ride a bicycle? 7. Did you have your own bicycle? 8. Do you remember who taught you to ride a bicycle? 9. Did you have a bad bicycle accident? 11. What was your favorite subject? Why? 12. What was your favorite game? 13. Who did you play it with? 14. Who gave it to you? 15. When did you like to play it? 16. Do you remember anything about your personality when a child? 17. Were you good at making friends? 18. How did you make friends? 19. Did you have a lot of friends? 20. What did you enjoy doing with your friends? 21. What were some embarrassing situations when you were a child? 22. Were you a good student? 23. Did you enjoy going to school? 24. Did you get good grades? 25. Did you enjoy doing your homework? 26. What did you like about school? 27. What didn't you like about school? 28. Who was your best friend? 29. How did you meet this friend? 30. What did you do together? 31. Do you still do things with this childhood friend? 32. What other things can you tell us about your best friend? 33. Were your parents super protective? 34. At what age could you go places by yourself? 35. Did your parents always tell you what to do? 36. Did you play outside? 37. What did you like to play? 38. How long did you play outside a day? 39. Could you play outside all year long? 40. Did you play on the streets? 41. Was it dangerous to play in the streets? 42. What kind of things did you do in the streets? 43. Did you ever have an accident while playing in the streets? What happened? 44. When you were a child, what did you want to grow up to be? 45. Can you remember specific things from your childhood clearly? 46. How old were you at the time of your first memories? 47. What kind of food did your like? 48. Did you used to eat anything or were you a picky eater? 49. What foods did you like eating? 50. What foods didn't you like to eat? 51. Did you have any foods you hated? 52. What was your favorite toy when you were a child? 53. Who gave you this toy? 54. Did it have a name? 55. Do you still have it? 56. What was your worst punishment as a child? 57. Where did you grow up? Did you move frequently? If so, why? 58. Who took care of you when you were little? A parent? A grandparent? A nanny? A daycare center? 59. How are you similar to your parents? How are you different? 60. Describe the first memory you have of going to school. 61. Do you think children today eat too much fast food and don't play enough sports? 62. What childhood diseases did you have? 63. Did you have any nickname? Tell us about it. 64. Were you afraid of anything? What? 65. What were your favorite cartoons and TV shows? 65 konverzačních frází o dětství. Naučte se v angličtině konverzovat o dětství. 65 anglických otázek o dětství vám v tom pomůže.